If you’re concerned about your drinking water and are looking for an alternative to expensive bottled water, one of the best things you can do it learn how to distill water at home. The first step? Getting the best water distiller on the market. We researched some of the highest rated products out there and put together this buying guide to help you find a top-quality machine. First, let’s take a look at some of the key things to keep in mind. Countertop: All of these products are designed to sit right on your countertop. They generally have a sleek, modern design and come in a variety of finishes. Match your stainless steel appliances or get one that brings a pop of color. 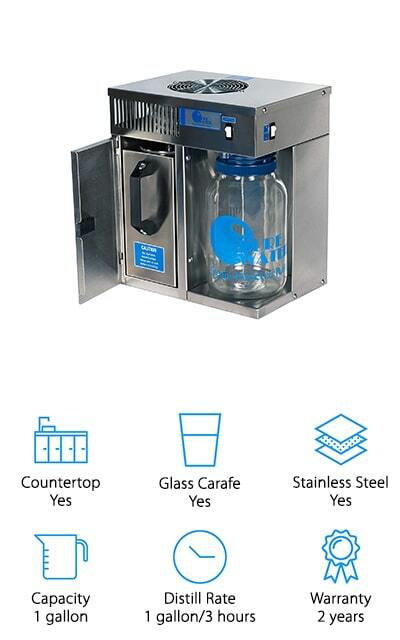 Glass Carafe: Most of these machines come with a glass carafe, although there are a few that are plastic. If you’re unsure about using a plastic collection container, rest assured that they’re food-safe and usually BPA free. Stainless Steel: All of these distillers feature a stainless steel distillation chamber. Some even have stainless steel on the outside, too. This is important because there’s no risk of lead exposure or anything like that plus it’s unlikely to rust. Capacity: These machines all produce about a gallon of water at a time. Some of them are measures in liters instead of gallons and produce 4 liters which are just about the same amount as a gallon. Distill Rate: Distill rate is how long it takes to produce a gallon of water. It varies from one model to the next. The fastest one makes a gallon in about 3 hours, the slowest in about 5.5 hours. Warranty: Most of these machines are covered by a 1 or 2-year warranty. That said, we also find one with no warranty coverage at all and one that covers the stainless steel parts for 15 years. Now that you know what to look for, let’s move into the next part of our water distiller buying guide, our reviews. If you’re in a hurry, check out our top and budget picks first. That’s the best way to see the range that’s available. We made them easy to find, they’re the first 2 items on our list. Stick around if you can, all of these items are top notch. Ready to find out what’s the best water distiller? Let’s go! 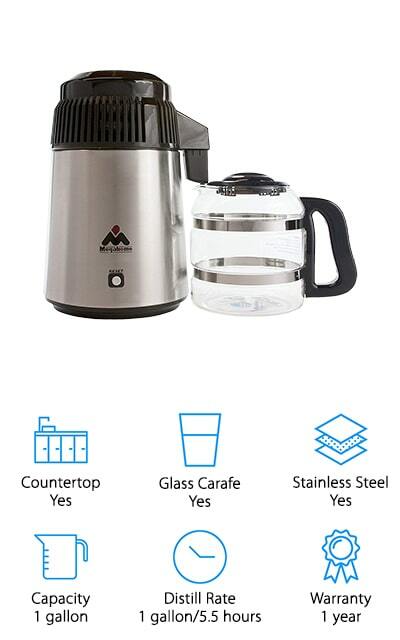 Our top pick for best home water distiller is the Megahome Countertop Water Distiller. Both the interior and exterior are completely made of stainless steel. In fact, the entire boiling chamber and condensing coils are, too, and since the water collects into a glass carafe, it never touches plastic. Plus, it looks great on your countertop. It’s easy to use, too, and feature a simple, intuitive design. All you have to do is fill the boil chamber, press the start button, and wait. It distills a gallon of water in about 5.5 hours and automatically turns off when it’s done. It includes a 6-month supply of activated carbon sachet filters and boil chamber cleaner so you can make sure you’re always getting the best possible water. Next up is our budget pick, the Mophorn Water Distillation Purifier. With a distillation rate of 1 gallon every 4 hours, this machine can make up to 6 gallons of water every day and is quiet enough to run overnight. Assembly is easy and then all you have to do it add water and push the button. It has a built-in thermometer that prevents overheating and turns off automatically when it’s done. The inside is stainless steel while the outside is made of baked enamel. It’s actually available in a few different colors, too, so you can choose what works best with your kitchen decor. There are large openings for easy access and cleaning and a convenient handle that makes it easy to transport or store. 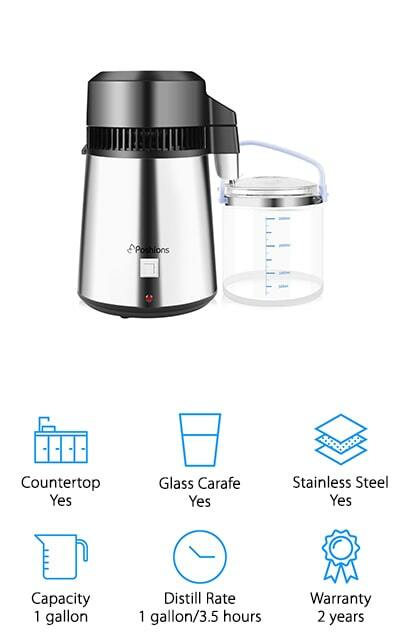 If you want a countertop water distiller but don’t have a lot of extra space, the Pure Water Mini-Classic Distiller might be the right choice for you. It’s small enough to fit under low-kitchen cabinets but don’t let that fool you. 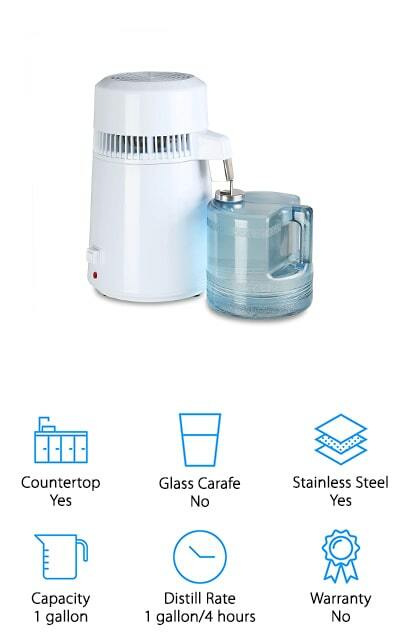 This powerful machine distills a gallon of water in about only 3 hours and the internal stainless steel construction means that your water won’t come in contact with plastic at any time. Operation is really simple and they include a charcoal filter to get you started right away. That’s not all, the warranty coverage is pretty nice, too. All electronic components are covered for 2 years while the stainless components are covered for an impressive 15 years. The company provides great customer service, too. 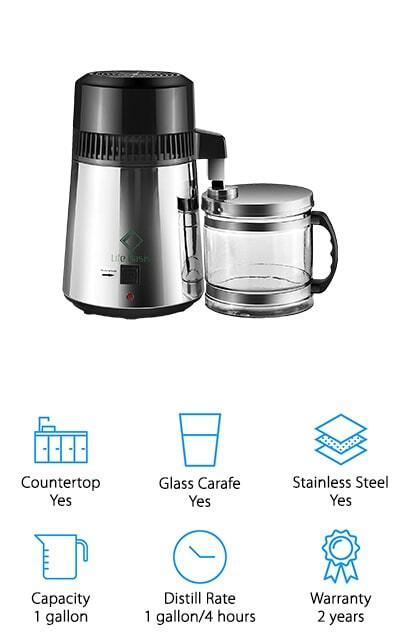 Another great choice for best countertop water distiller is this machine from ECO. The steam chamber and condensing coil and made of 100% stainless steel and all plastic components are food-safe and BPA-free. While the outer body is made of plastic, the water never comes into contact with it because it uses a glass-lined spout and carafe. This machine can distill a gallon of water every 4 hours which means you can get up to 6 gallons every day. For safety, the automatic shut-off kicks in when the reservoir is empty or if the temperature gets too hot. It includes a carbon filter that eliminates any impurities that remain after distillation and it’s easy to set up, operate, and clean so you can get started making clean, pure water right away. H2oLabs Water has rigorously tested their distiller for dependability and performance. It starts at the push of a button and has an automatic shut off so you can set it and walk away. This distiller features a stainless steel steam chamber and condensing coil. Any plastic parts are food safe and BPA free. In fact, the nozzle even features a porcelain insert to prevent the water from coming into contact with plastic at any time. Also included are a large jar of cleaning crystals and a year’s supply of activated carbon filter pods. They use 3 times the amount of filtering media to produce the purest water possible and last twice as long for easy maintenance. 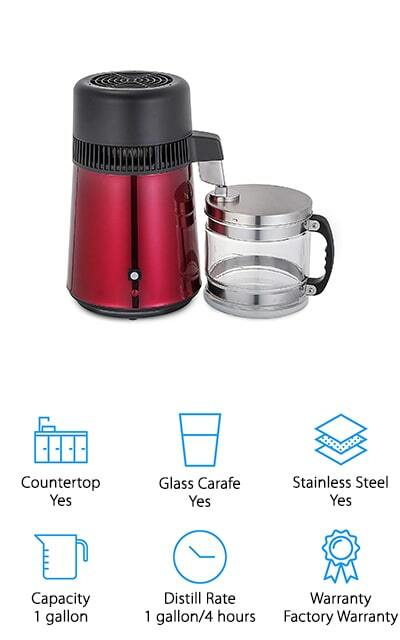 Cleaning is easy, too, because the machine and the carafe have large openings for easy access. Next in our best water distiller reviews is this machine from VEVOR. It makes up to 6 gallons of water per day, or 1 every 4 hours. Because of its quiet operation, you can even run it safely overnight. Plus, it monitors the temperature and automatically shuts off if it gets too hot which makes it very safe to operate. The fan is made of aluminum while the inside of the distiller is made of high-quality stainless steel. That’s not all, since the carafe is made of glass, the water actually never comes in contact with any plastic parts or pieces. This distiller is covered by a factory warranty and is available in a few different finishes so you can choose one that matches your kitchen or even add a pop of bright color. 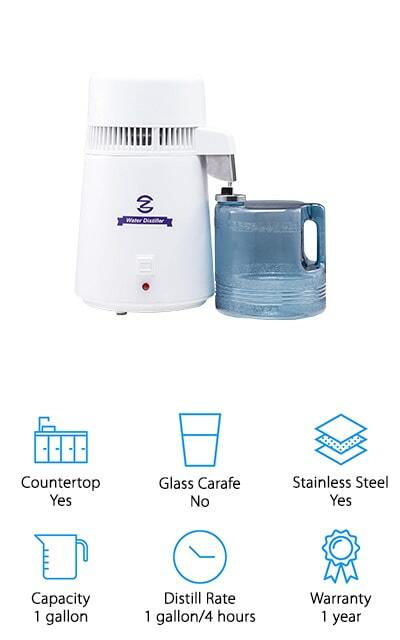 The CO-Z Water Distiller is FDA approved which means that every part of the machine is completely safe for contact with your water. The entire steam chamber and condensing coil are made of high-grade stainless steel and any plastic in the design is food grade and BPA free. It produces about a gallon every 4 hours and as many as 6 gallons in a day. The design is really easy to use, just fill it, press a single button, and you’re off. Maintenance is easy, too. The distiller and the carafe both have large openings so you can clean them quickly. An automatic shut off kicks in when the water is too low or if the temperature exceeds 300 degrees F which means it’s really safe to operate. Up next is the CNCShop water Distiller. If you’re looking for a good product for the money, this machine produces the same quality water as other machines that cost a lot more money. 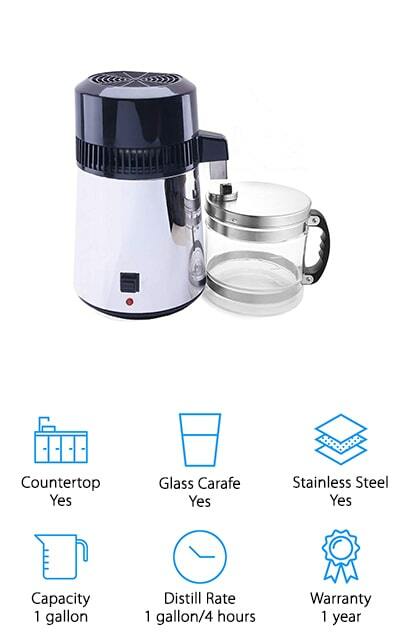 The condensing coils and inner heating chamber are made of stainless steel and it comes with a plastic collection jug. Although the plastic is BPA-free, if you don’t want your water coming in contact with plastic at all, you can easily swap it out for your own glass container. This distiller has an automatic shut off that kicks in if the temperature gets too hot at around 320 degrees F and also when the internal chamber is empty. It makes 1 gallon of water every 4 hours or so and includes cleaning powder to keep the chamber as clean and fresh as possible. 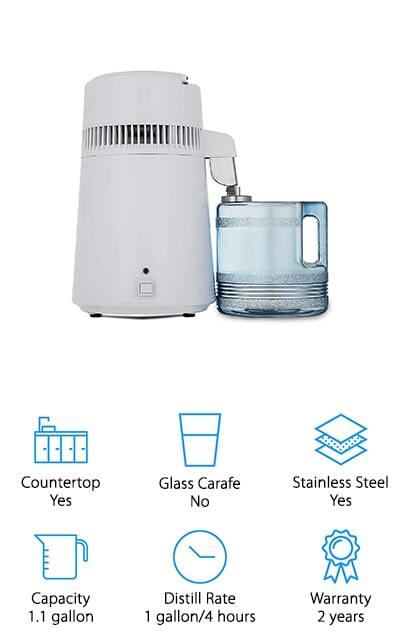 The Life Basis Water Distiller is made of high-quality stainless steel, both inside and out and looks great sitting on your kitchen counter. It includes a glass collection container and has a food-grade silicone water outlet cath so you never have to worry about your water coming in contact with any plastic. There are some other great features, too, like an indicator light to tell you when it’s running, a non-skid base, and ventilation holes that protect against overheating. This water distiller produces about 1 gallon of water every 4 hours and turns off automatically when it’s done. That’s not all, it even includes 5 carbon filter bags that last about a month each so you’ll have plenty of supplies to get you started right away. Our last pick is this distiller from Poshions. It’s one of the quickest machines we found in our research and can produce a gallon of water in as little as 3.5 hours. Both the interior and exterior are made of stainless steel and it uses a glass collection bottle so your water never comes in contact with plastic. It’s also really easy to use. To turn it off and on, simply use the on/off button. There’s no need to unplug. This machine has a lot of safety features in place, too. For one thing, it turns off automatically when the distilling chamber is empty. It has ventilation holes, a high-temperature shut-off, and there’s even a fuse holder which is safer in the event of any electrical issues.